Thousands protest against the Quebec Charter of Values. 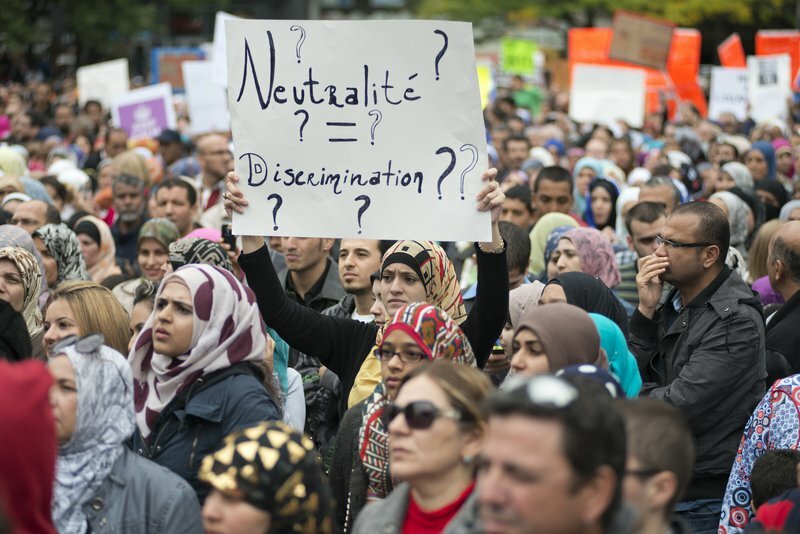 The sign questions whether "neutrality" will end discrimination. Credit: Demotix. As a recent arrival in Canada from Pakistan, I know that immigration is a deeply emotional and gut-wrenching personal experience. Good policies on immigration are important, but policy doesn't account for the guilt that arises when you leave your loved ones behind. Policies don't reflect the pain of not being able to make it back in time to say your final goodbyes to your parents. They don't assuage the helplessness of watching your country of origin go up in flames as you watch from the sidelines, unable to respond because people there view you as a deserter. Policies don't account for the feeling of failure when all your decades of accomplishment go unrecognized in your new home. Canadian society claims that immigrants can integrate in whatever ways we want, but it's never that simple. Wherever we go, we are constantly responsible for justifying our choices, because they might conflict with the values and priorities of our hosts. Even in Canada, where immigration policy is relatively generous (an average of 250,000 immigrants have entered the country annually for the last ten years), immigration policies don't reflect - or even attempt to understand - the social and cultural realities that immigrants bring with them. These issues were recently brought to the fore by the “Charter of Values,” a proposal from the Quebec provincial government that seeks to impose a sweeping ban on "ostentatious religious symbols” worn by certain groups of public officials. The ban would apply to teachers, judges, hospital staff, daycare workers and police, among others. “Ostentatious” symbols include hijabs, niqabs, turbans, kippas and “larger-than-average” crucifixes. The stated purpose of the Charter is to promote secularism within state functions. But the outcry over the exclusionary effects of such a ban has exposed a deep fault-line in the ways Canadians view immigrants, and by extension, the ways they see themselves and the future of their country. At root, this is a debate about assimilation versus transformation – and whether Canada can move beyond a thin veneer of multiculturalism to create a new society. As we were leaving a movie theatre in Ottawa recently, a friend of mine remarked: "This hall is full of immigrants." "What makes you say that?" I asked. She answered, "because there wasn't a single voice speaking English." My friend's remarks were ironic, given that she was originally an immigrant herself. It was also strange as Canada is one of the few countries in the world that has always celebrated its diversity. The 2011 census shows that bilingualism is surging, though not necessarily in the country's two official languages of French and English. This pattern isn't restricted to language. Racial diversity in Canada has created a palette of styles and colors on the streets of Toronto, Vancouver and Montreal, where hijabs and headdresses have begun to jostle for space with mini-skirts and tank tops. Canada was the first country in the world to adopt an official policy on multiculturalism, initiated by Pierre Trudeau in the 1970s and legalized in 1988. Its main purpose was to support and encourage a growing immigrant population in the face of demographic challenges and shortages of labor. Originally intended to preserve a "mosaic of ethnicities", the emphasis of Canadian immigration policy today is on promoting "inclusive citizenship to avert a clash of cultures." What exactly does this mean? Does the mere presence of more immigrants mean greater multiculturalism? If so, does increased multiculturalism mean that Canada is transforming itself into something different over time? If not, does averting a 'clash of cultures' mean that multiculturalism is dead? For a relatively recent immigrant like myself, this situation is both unpredictable and confusing. It forces me into a series of false choices. I have to choose between leaving my beliefs and values behind when migrating, and bringing them with me for multicultural display. Between socializing within my own community in order to ease the burden of migration, and fraternizing with white Canadians in order to integrate with them, alienating my ethnic relations in the process. Do I insist on using outward appearance as a form of individual self-expression while fuelling a growing resentment against my religion? In Canada's eyes, do I stand as an outsider, or as someone who can add value to Canadian society? Most immigrants (including myself) move to a different country to expand their own horizons. But they also want to play a role, however small, in contributing to the places they choose to live in, to increase their sense of belonging and to see something of their own culture and history reflected in the future of their new home. They want to participate in the transformation of Canadian society, however threatening that turns out to be for those who have lived there all their lives. Neither the Federal Government nor Canadian public opinion backs Quebec's proposals. However, the tactic of using the religious and cultural preferences of immigrants to advance or defend a particular view of what it means to be Canadian is nothing new. In the late 1980s, the Royal Canadian Mounted Police were forced to remove a ban on Sikhs wearing turbans while on duty. In 2011, the Canadian government banned Muslim women from wearing face coverings when taking the official oath of citizenship. In 2012, the Supreme Court of Canada reached a split decision on the right of women to wear religious veils while testifying in court. And most recently, the country has been faced with numerous cases of forced marriage among new immigrants, as well as the threat of home-grown terrorism among naturalized Canadian citizens. While taking care to steer clear of the Charter of Values controversy, Canadian Prime Minister Stephen Harper recently stated: "Our job is making all groups who come to this country, whatever their background, whatever their race, whatever their ethnicity, whatever their religion, feel at home in this country and be Canadians." The problem is that 'being Canadian' for new immigrants means having to become someone else. In personal and social terms, that's not easy for anyone to do, especially if it means falling into line with an entirely new set of societal norms and obligations, including those laid out in official policies and regulations. I was shopping recently at a grocery store in Ottawa, and found myself standing between an Eastern European woman who barely spoke any English and a white Canadian cashier who was trying to help her use the debit card machine for cash-back. The customer was expressionless, confused and slightly worried. The cashier was just plain exasperated and ready to give up. Canada deals with this kind of 'clash of cultures' every day, but conventional notions of multiculturalism don't address these differences, they simply bury them. A transformational approach to immigration would confront and work through these differences in order to arrive at a different solution entirely - a new society marked out by a plurality of values and relationships that reflect the realities of every group, immigrants and non-immigrants alike. That requires a deeper dialogue between all communities in Canada, in which people like me must stand up and argue for a much more positive and creative resolution. Immigration isn't just about transforming the lives of others, but the lives of all of us, together.